Crispy Parmesan Roasted Broccoli is cooked in the oven until the edges are caramelized and crispy, and then sprinkled with parmesan cheese. Alright, people. You need to listen up here because this recipe is going to change the way you look at broccoli forever. It's that good. You could call it my new obsession. I would understand if you're thinking to yourself, "What could possibly be so exciting about broccoli?" And you know what? I wouldn't blame you. Because if I was eating plain old steamed broccoli, I would be saying the same thing. But this is not plain old steamed broccoli. Oh, no. Not by far. In fact, this is the best broccoli I have ever eaten. 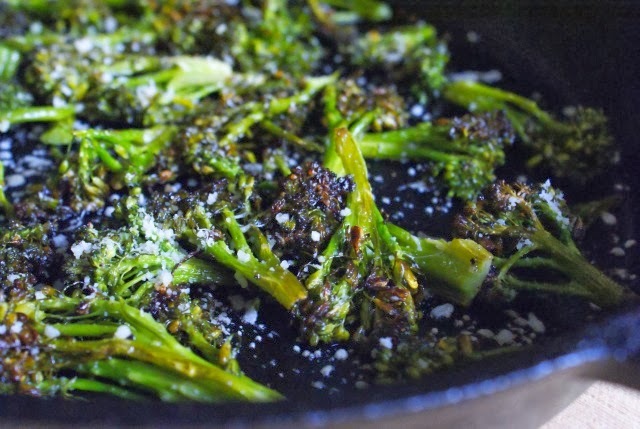 Roasting the broccoli along with just a few simple seasonings and olive oil creates crispy, caramelized bits around the edges that are to die for. If you ask me, the crispier, the better. Don't worry, the browned parts doesn't taste burnt. In fact, the caramelization brings out the broccoli's sweetness. Pair it with the salty parmesan and it is a match made in heaven. Wash the broccoli and dry it thoroughly. Cut into florets, leaving the stems of the florets fairly long. If the florets are large, cut them in half. In a large bowl, toss together the broccoli, olive oil, salt, pepper, and garlic powder until all of the florets are coated. 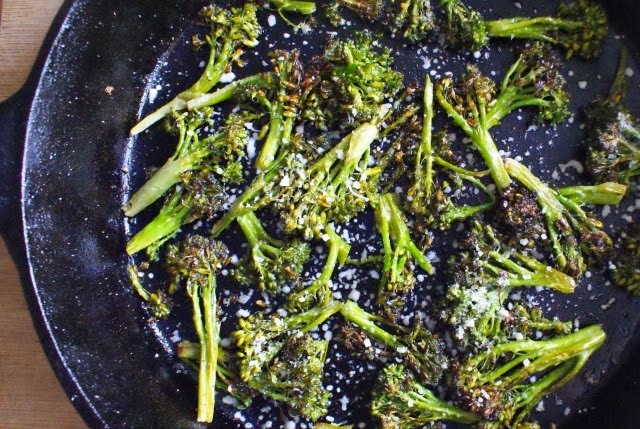 Spread the broccoli in a single layer into a large cast iron skillet or onto a foil-lined cookie sheet. Roast for 10 minutes, flip, then roast for an additional 10-15 minutes, depending on how crispy you like them. Sprinkle with the grated parmesan and serve. You are an evil, evil temptress miss Becky. I'd leave my wife on Christmas morning for a woman who could cook like you. That looks amazing! Sounds really yummy. You might want to reconsider baking with olive oil at that temperature which is around or above its smoking point. If the oil goes above the smoking point then the oil chemically changes and becomes really unhealthy.